Among the long stretch of hotels that dot South Carolina’s coastline, The Inlet Sports Lodge may be the most unique. A boutique hotel catering to golf lovers and fishing, boating and outdoor enthusiasts, the facility added another accolade Tuesday, Oct. 30, to its growing list of awards as Strovis and the Georgetown County Chamber of Commerce presented the Murrells Inlet hotel’s staff with the Business of the Month Award for November 2018. Warren Beckham, the lodge’s general manager, and staff members Catherine Rotman, Michael Eisenhardt and Kathy Arroyo were on hand for the presentation. Strovis Chief Operating Officer Tracy Mau and Chamber President and CEO Beth Stedman presented The Inlet Sports Lodge staff with a framed certificate, and a special 7-foot-tall banner will also be displayed throughout November at the lodge, signifying the establishment as an award-winning Chamber member. Located in the heart of Murrells Inlet at 4600 US 17 Business, The Inlet Sports Lodge caters to sports and outdoor enthusiasts – everything from golf to fishermen, or anyone simply looking to relax. The lodge is just one mile north of the Murrells Inlet Marshwalk and Marina, where guests can enjoy a variety of award-winning fresh Lowcountry dining and a variety of watersports. The lodge is also only minutes away from many of the area’s most recognized golf courses – including the lodge’s very own affiliated courses – Caledonia Golf and Fish Club and True Blue Plantation and all the courses of the Waccamaw Golf Trail, plus dozens of boutique shops, beaches and historical area attractions. The Inlet Sports Lodge opened in October 2010 as a fractional ownership property and is also open to the public as a hotel. Through its Ownership Program, owners receive memberships to Caledonia Golf & Fish Club, True Blue Plantation, Huntington Beach State Park, Brookgreen Gardens & Freedom Boat Club. As a regular patron of the lodge, guests can enjoy exclusive rates for golf packages with premier courses, and close proximity to the area’s several marinas, docks, boat access points, hiking and bike trails. When presented with the Business of the Month Award, Beckham said the lodge is grateful for the recognition and said he was pleased to be part of the greater Georgetown County community. Mau, who when she’s not working at Strovis can be found fishing, hunting or just spending time in the great outdoors, told the lodge staff how impressed she was with the facility. The Business of the Month Award is only the latest in accolades for the lodge. Southern Living Magazine included the lodge in its Reader Deal in 2013. It received the Trip Advisor Certificate of Excellence three years in a row and was named as an Interval International Premier Boutique Resort five years in a row. In 2011, it received the Gold Star of Excellence Award from the Myrtle Beach Hospitality Association. The Inlet Sports Lodge offers deluxe studios and luxury suites for guests to choose from when staying in Murrells Inlet. The rooms feature a kitchenette with standard refrigerator, microwave, coffee pot, two top burner stove, dishwasher and basic cookware and dining utensils. The lodge has business and entertainment areas that can be rented for meetings, parties and even weddings. For more information about The Inlet Sports Lodge or to make reservations, call 877-585-9360. 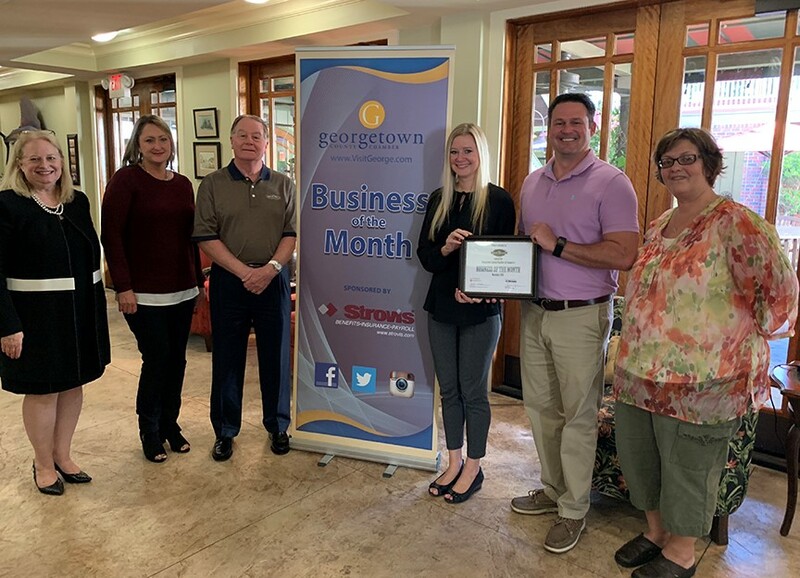 The Business of the Month Award honors Georgetown County Chamber-member businesses for being leaders in the community, and Strovis is proud to serve as the official corporate sponsor. Strovis CEO Jenna Jordan said she’s pleased to be that Strovis is the corporate sponsor for the award. About Strovis: Strovis was founded in 1998 and has served clients in 32 states. The company has three divisions: Strovis Insurance, Strovis Payroll & HR and Strovis Benefits. To find out more how Strovis can help your company with payroll, benefits and/or insurance needs, go to www.strovis.com. It’s all about being Southern at Moe’s Original Bar B Que in Pawleys Island – from the delicious food the eatery cooks up to the neighborly way of lending a hand in a time of need. On Thursday, Sept. 27, Moe’s was recognized by Strovis and the Georgetown County Chamber of Commerce as the Business of the Month for October 2018. Moe’s was honored for its service and dedication as a Chamber member but also for its recent work to make sure emergency workers and National Guard troops received good, hearty meals during these past few weeks in the aftermath and flooding from Hurricane Florence. Located on the thoroughfare of Highway 17, J.J. and Bridgett Murphree teamed up with Meg Lonon and brought the first Moe’s Original Bar B Que to the Pawleys Island area, which is known for its leisurely, laid-back way of life. With an open kitchen and a full bar, Moe’s serves up Alabama-style barbecue and southern sides in style whether seated inside, on the patio or on the covered, screened porches. The restaurant offers a carefree feel that is great for locals, families and visitors to come eat a great meal while watching a game or enjoying music. The restaurant also offers full-service catering for parties and events. Moe’s is open in Pawleys Island seven days a week. Moe’s Original Bar B Que was founded by Ben Gilbert, Mike Fernandez and Jeff Kennedy. After meeting at the University of Alabama in Tuscaloosa, they instantly became friends and had a mutual interest in all things Southern: barbecue, blues, college football, and whisky. In 1988, Mike hooked up with Moses Day in Tuscaloosa and began learning to fire roast meats. The men were lucky to learn from Moses and his distinct style makes up Moe’s original flavor of barbecue. The company now has franchises, like the one in Pawleys Island, in 17 states. The Business of the Month Award honors Chamber-member businesses for being leaders in the community, and Strovis is proud to serve as the official corporate sponsor. A special 7-foot-tall banner is displayed at the chosen business throughout the month, signifying the establishment as an award-winning Chamber member. In addition to the banner, a special framed certificate is also presented to the honored business. Moe’s is located at 12827 Ocean Highway in Pawleys Island and is open daily from 11 a.m. until 9 p.m.
Strovis Holdings Chief Marketing Officer Mark A. Stevens represented Strovis at Thursday’s presentation. Strovis has served as the award’s official corporate sponsor since 2017. Strovis was founded in 1998 and has served clients in 32 states. The company has three divisions: Strovis Insurance, Strovis Payroll & HR and Strovis Benefits. The senior management team at Strovis includes, from left, Tony Jordan, president, Jenna Jordan, CEO, and Tracy Mau, COO. Tony and Tracy have been with the company since the company was formed in April 1998. It all started 20 years ago with a shared vision by Tony Jordan and Tracy Mau, and today Strovis is one of Georgetown’s most successful businesses, having served clients in 32 states from four South Carolina offices with three distinct company divisions. Jordan now serves as president of the company, and Mau is chief operating officer. Jordan’s daughter, Jenna Jordan, is the CEO. Together, the Jordans and Mau have created a multi-faceted business, offering everything from payroll and human resources consulting to company benefit plans and personal and commercial insurance plans. On Thursday, October 25, Strovis will celebrate its two decades in business by hosting a special Business After Hours event with the Georgetown County Chamber of Commerce. The public is invited to attend the celebration from 5:30 to 7 p.m. at Strovis’ corporate headquarters at The Highmarket Business Center at 1309 Highmarket St. in Georgetown. Food and beverages will be provided, and those attending will be eligible to win a select number of door prizes. “We are delighted to have an opportunity to celebrate our 20th anniversary with our friends and fellow businesses here in Georgetown County,” said Jenna Jordan. “We recognize that we have many reasons to be grateful for all the support we’ve received from our local community here in Georgetown. While Strovis has grown over the years and expanded into new markets, we will never forget that we started right here in Georgetown with one employee but some big dreams. Strovis traces its roots back to April 13, 1998, when 29-year-old Mau became the company’s sole employee after meeting with Tony Jordan, who provided the necessary capital to start the company and was already an established businessman and community leader in Georgetown. With Jordan providing the financial means to start the company, Mau provided the knowledge and the labor. As the company grew, Jenna Jordan joined the company in 2003 as benefits administrator before becoming CEO in 2013. In the beginning, the company was called Unistaff Inc., before changing to USI Administrative Services in 2001 and, once again, in 2012 to Strovis, which stands for Strong Vision. The Strovis corporate offices are located in the the Highmarket Business Center at 1309 Highmarket St. in historic Georgetown, South Carolina. Those attending the Business After Hours event can tour the Strovis corporate office and also enjoy a delicious selection of catered foods underneath tents outside. Some special presentations will be made, as well as drawings for prizes. Over the years, the company’s business model has progressed and expanded. Today Strovis Holdings now represents three entities: Strovis Payroll & HR, Strovis Insurance and Strovis Benefits. These three entities also partner to provide a one-stop outsourcing shop for small business employers. In addition to the Georgetown corporate office, Strovis has offices in three other South Carolina locations: Murrells Inlet, Mount Pleasant and Summerville. Strovis Payroll is an employee administration company and takes the services and expertise of a large corporate HR department and provides them to small- and medium-sized businesses in customizable packages. Strovis Insurance is an independent, multi-line insurance agency specializing in personal and commercial insurance. Strovis Insurance represents a wide array of carriers to meet the needs of our clients and partners with dozens of nationally known companies. Strovis Benefits is a full-service independent health and benefit advisory firm for small- to medium-sized businesses and their employees in the Carolinas. The division provides unbiased access to the most current and competitive health plans through the federal individual and SHOP marketplaces, private carrier exchanges, and Strovis’ own direct individual marketplace, Strovis Marketplace. Advisers have been providing health plan services to individuals and employers in the Carolinas since 2001. Chamber of Commerce members may register to attend the Sept. 6 event here: Business After Hours Registration. Registration is encouraged for planning purposes. While the celebration is in partnership with the Chamber of Commerce, the event is open to all, regardless of Chamber membership. To find out more about Strovis, go to www.strovis.com. You can get free insurance quotes here: www.strovisinsurance.com. You can get free quotes for payroll services here: www.strovispayroll.com. You can get free quotes for benefits plans here: www.strovisbenefits.com. To speak with a company representative, call 1-888-220-9684. It was a sweet Thursday morning at Gilbert’s Ice Cream when Strovis and the Georgetown Chamber of Commerce presented the Pawleys Island shop with the Business of the Month Award. The family-owned business has been serving customers its homemade ice cream since May 2017. The Business of the Month Award honors Chamber-member businesses for being leaders in the business community, and Strovis is proud to serve as the official corporate sponsor. A special 7-foot-tall banner is displayed at the chosen business throughout the month, signifying the establishment as an award-winning Chamber member. In addition to the banner, a special framed certificate is also presented to the honored business. Strovis President Allen Altman and Strovis Payroll Operations Director Jillian Sanchez attended the Aug. 2 presentation and thanked Gilbert’s for being a Chamber of Commerce member. Gilbert’s Ice Cream is a family-owned business that prides itself on premium ingredients. All of the shop’s ice cream is handcrafted in its kitchen, along with a selection of tempting baked goods. Maryland transplants Bob and Deborah Gilbert and daughter, Angela, operate the shop. Angela and Deborah attended classes at St. Louis school to learn what it takes to make the best ice cream. The shop offers a variety of ice-cream flavors – everything from the traditional vanilla and chocolate to specialty creations such as Southern Bourbon Butter Pecan, Grape Sorbet and Lemon Blueberry. The Gilbert family also boasts a good sense of humor. Customers can pick up a logo-emblazoned T-shirt with this mantra on the back: “A balanced diet is a cone in each hand.” And customers always get a chuckle when choosing what type of cone they’d like for their ice cream. On display are chocolate-dipped cones, a “Cool Blue” cone and, just for laughs, a pine cone still on a broken tree branch. Both the South Carolina House and Senate have introduced legislation proposing solutions to the state’s underfunded infrastructure problem in the forms of Senate bill 54 (S. 54) and House bill 3516 (H. 3516). New infrastructure maintenance fee when first registering a vehicle: set at five percent fee capped at $500 on newly purchased vehicles, and a five percent fee capped at $250 for vehicles purchased in other states but registered in S.C. While neither bill incorporates DOT reform, both seek to raise revenues between $600-$900 million to create a long-term solution for South Carolina’s infrastructure. Last month (November 2016), the Leadership Georgetown County (LGC) 25th Annual Class began (following a slight delay due to Hurricane Matthew’s havoc in October) with Putting a Face on Human Need. Amy Downing of the Bunnelle Foundation provided an overview on human needs, followed by site visits to worthy nonprofit organizations such as A Father’s Place, Tara Hall for Boys, Friendship Place, Habitat for Humanity, and a presentation by Freedom Readers. The LGC class learned about the high level of need throughout many areas of Georgetown County. This month’s (December 2016) LGC Class learned about Health and Wellness, beginning with a trip to Smith Medical Clinic in Georgetown and an enlightening session presented by Anne Faul, Executive Director. Anne told us about the over 200 volunteers and trained medical staff that provide quality one-stop health care and intervention for those most vulnerable and who can least afford it. Smith Medical Clinic serves those who fall below 200% of the poverty level which is 1 in 3 (or between 17,000-19,000) adults in Georgetown County. Smith Medical Clinic works with Tidelands Medical Center to provide medical treatment and follow-up, medications, X-rays, etc. and there is not one paid doctor on staff. The docs are all volunteers – a simply amazing organization in Georgetown County improving healthcare for those who need it most! The Class then heard from Bruce Bailey, CEO of Tidelands Healthcare System, where he explained Tideland’s service area, the issues facing the medically insured (e.g. high deductible plans), the uninsured, and the precision-focused goals and activities of Tidelands Healthcare System in tandem with Tidelands Care Community Network to reduce waste and the overall cost of healthcare, subsidize those without health insurance, improve the physician’s network in the community, provide healthy incentives for getting well and staying well. He explained how the population in Horry and Georgetown counties is exploding with 12,000 new residents anticipated every year over the next 5-10 years. Other representatives from Tidelands Community Care Network illustrated how Tidelands Care Community Network develops individualized care programs to address health issues tied to food insecurity, lack of transportation, root challenges such as insufficient access to basic necessities such as electricity, water, and food. The most important thing we learned is that although some states have expanded Medicaid, South Carolina decided NOT to expand Medicaid, making access to healthcare even more challenging for many throughout Georgetown County. Class members decided this will be one of the topics it will discuss with legislators in Columbia during its March 2017 session. LGC participants then traveled in separate groups to visit Georgetown YMCA, the Family Justice Center of Horry and Georgetown Counties, and East Bay Park. Georgetown YMCA Director of Operations Anne Salley, and Kim Tomlinson (Membership and Marketing Director) explained the valuable SPLASH Program that the YMCA offers through a grant from the Bunnelle Foundation to ensure every 2nd Grade student throughout Georgetown County receives water safety training for two weeks, three times a week, every year. The Y also provides valuable preventative health programs to increase wellness across all age groups. Transportation challenges prevent many from being able to take advantage of the Y’s valuable and cost effective programs. If YMCA Georgetown had a bus, more children could be bussed in for summer programs, and they have someone available to drive it, but funding for the bus is currently not available. Bathing suits and towels are also needed for some 2nd Grade students. LGC class participants are thinking about how they may be able to assist. At the Family Justice Center, Co-executive Director Vicky Bourus provided a perspective on domestic violence. The Family Justice Center recently took on serving Horry County too because there was no organization in Horry County to address this need. The Family Justice Center provide emergency shelter, counseling and basic needs, along with court advocacy, paralegals to help women apply for orders of protection, and helps them navigate through the complicated court, medical, social services, and law enforcement system. In Georgetown County alone, the LGC class learned that the Family Justice Center will serve over 900 clients! Vicky Bourus explained the need for strong community partnerships with other nonprofit organizations, law enforcement, and professionals to help identify the early signs of domestic violence that accelerates over time. The LGC class also learned that in the state of South Carolina, perpetrators are offered either 26 weeks of rehabilitation or they may pay a fine. Other states have 52 weeks of rehabilitation available. The LGC class plans to speak to legislators in Columbia about increasing rehabilitation to a longer term of 48 to 52 weeks, and NOT offering the option of a fine because in South Carolina, less than 10% of perpetrators opt for the treatment! The last site visit was to beautiful East Bay Park, a hidden gem in the City of Georgetown on the majestic Winyah Bay to see the Park and enhancements made by the LGC Class of 2015 (last year’s class). We saw the five exercise stations scattered throughout the Park, free for all, designed to enhance the health and well-being of all who take advantage of the Park and its other recreational facilities! Nice job LGC Class of 2015! Thank you for putting your time and resources into such a great project that enhances the lives of so many in Georgetown County! The 2016-2017 LGC class thanks the four agencies and programs that graciously allowed LGC students to visit and the staff who took the time to talk to them about their work. We are looking forward to our remaining sessions to come so stay tuned to our blog as we’ll be providing more updates throughout this exciting program! Learn more about Leadership Georgetown County by calling the Chamber at (843) 546-8436 or emailing slewis@visitgeorge.com. So Long and Good Riddance, Matthew! What a difference a week makes! Last Friday we were battening down the hatches, evacuating, awaiting the unwelcomed arrival of Hurricane Matthew. This weekend, the weather forecast is in keeping with what we usually expect this time of year--the sun is shining and it’s just a little cool in the evenings (by Coastal SC standards anyway!). What a glorious Georgetown County October day! Nothing could be finer . . . .
As we enjoy our much anticipated weekend with wonderful events underway such as the Wooden Boat Show and Pawleys Island Festival of Music and Art in addition to lots of golf, football and other outdoor activities (that hopefully include more than yard-raking), please be mindful of and thankful for of all of those who continue to help us heal from the storm. City of Georgetown crews have managed a mammoth task of clearing mounds of debris so that our friends and guests can enjoy the Wooden Boat Show. There are countless others who are out there toiling day and night—and who are putting their personal lives at risk and on hold—so that we can return to our regular lives and routines. THANK YOU! As County Administrator Sel Hemingway pointed out earlier this week, many parts of our county remain in response mode. The County continues to focus its efforts on those whose lives and property are still at risk. Please keep in mind that there are still many in our own communities, our friends and neighbors, who are hurting and dealing with the impact from Matthew and its aftermath. Say a prayer, lend a hand, thank someone who is working to address our needs--and enjoy this glorious weekend! All Boil Water Advisories for Georgetown County have been lifted. The Black River crested at the county line near Hwy. 41 in Andrews Thursday night. The water will continue flowing east for the next day or so into Browns Ferry. We expect it may rise up to another foot in the Browns Ferry area, then start to drop. Georgetown County is still monitoring the Pee Dee and Waccamaw Rivers, but anticipate levels to be well below where they were last year. The County will release more details as they become available. If you're in an area where the river has not yet crested, remain vigilant. The South Carolina Department of Natural Resources will continue boat patrols on flooded rivers. Governor Haley asked that we be mindful that the rivers will have debris from the Hurricane that could damage boats and/or individuals. Road closures may change as river levels change. Please check the SC DOT website for a list of roads that are closed. Curbside hurricane debris removal will soon begin in Georgetown County. In the aftermath of Hurricane Matthew and associated river flooding in Georgetown County, the county has contracted with the S.C. Department of Transportation for removal of hurricane-related debris. As part of this contract, curbside pickup of hurricane-related debris will be available on public roadways in unincorporated areas of the county that were impacted by flooding. Collection is expected to begin Oct. 17. Curbside pickup will not be available on private streets (those with blue street signs). Only hurricane-related debris will be picked up. Large quantities of shingles and other roofing materials from re-roofing jobs will not be collected and must be disposed of via normal procedures. SCDOT’s contractors will prioritize debris removal based on which areas can be accessed safely for debris removal operations. In some areas, floodwaters and blocked roadways still prevent contractors from reaching debris. Residents are asked to place any hurricane-related debris they would like removed in the public right-of-way (the area that extends from the street to the sidewalk, ditch, utility pole or easement). Residents should not place debris on the right-of-way if they have or will receive insurance funding to privately dispose of household debris covered by their insurance policy. SCDOT will only collect hurricane-related debris for which residents are not receiving insurance funding for private disposal. For debris to be picked up, it must be separated into the categories listed above and must be unbagged (with the exception of waste in the household garbage category, which should be bagged). Other than household garbage, only loose debris will be collected. Residents should not place debris near a water meter vault, fire hydrant or any other above-ground utility, and should avoid placing it directly under power lines. Contractors will make multiple passes through impacted areas. If residents cannot safely set out debris at this time, or if contractors cannot safely enter submerged or blocked areas, additional debris removal passes will be scheduled. For more information, call (843) 545-3999 between the hours of 7 a.m. and 7 p.m. A brochure with further details will be posted at www.gtcounty.org. If you live within the limits of an incorporated municipality, you should contact municipal officials regarding their debris cleanup procedures. Call 2-1-1 One-stop resource for finding assistance or visit them online at http://www.sc211.org/. For additional needs/concerns, call Georgetown County Emergency Management at (843) 545-3273. Electricity Outages: If you are without electricity, please call your service provider. FEMA is still completing damage assessments. On 99.5 radio this morning, Congressman Tom Rice said that he fully expects that Georgetown County will be included among those counties whose businesses and residents will be eligible for FEMA assistance and he is working to ensure that this happens. We will keep you informed. However, if you have damage or loss from Hurricane Matthew, you may complete a FEMA application now even if your county has not been federally declared for Individual Assistance. This will help speed up the process if counties are added to a declaration. Your application will be processed if your county is added to a declaration and FEMA determines you are eligible. Please click here to start your FEMA application. When asked to choose a disaster, select the number for the disaster at the top of the page on the website. Currently, South Carolina is not listed, so click NEXT to proceed. You may also create an account when you apply. If you do, you will be able to log in later to check the status of your application. Completing an application does not ensure that you will be eligible for assistance.